Surfing with a sail boat?? Yeah, Chris... check what out? Not sure what I did wrong go here to see this. Please go forward to next page of posts for image Chris intended to post. Is that a sail drive? That doesn't look link surfing of any kind, but like ssullivan says... it still looks fun! Wow, so how do they secure the laptop?!?! Wow, this thread is funny. Might need a bit of moderation soon if we don't figure out how to see the surfing photo, however. It's supposed to be a family site. The link takes me (after a redirect) to a site suggesting I hook up with hotties @ Fling. Not running Linux. We may have to edit this one out. As the link stands, it violates the TOS on the site. Chris, want to take a stab at fixing the link or download the image you want us to see, then upload it to the forum? Ummm, I certainly didn't see what I expected to see when I clicked on the link. I think the picture that Chris wanted is on page 5 of Alen Wheelers photos on the photo gallery area of this site. 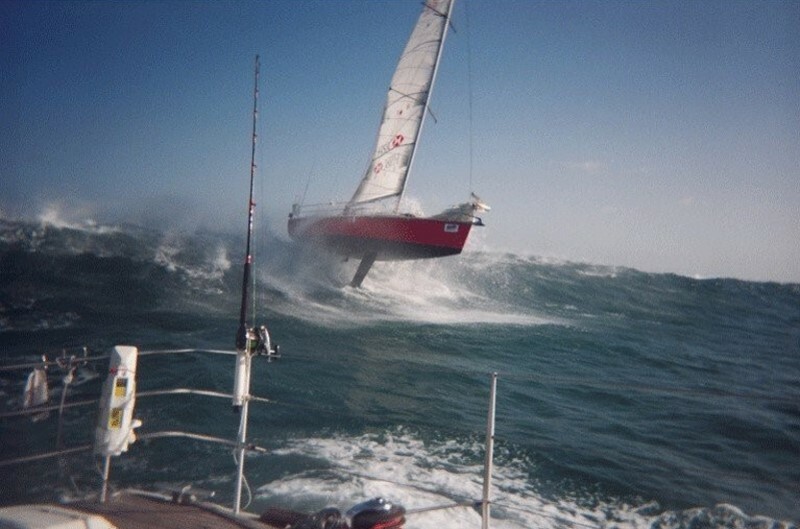 It is a red hulled sloop surfing over a large wave going over a sand bar - is this right Chris?